Chia seeds are derived from a plant called Salvia hispanica and its use in human civilization can be traced from Aztec Civilizations. These seeds are very rich in omega-3 fatty acids, richer than in flax seeds. The presence of Anti-Oxidants and a very long shelf life makes chia seeds special and important source of nutrients. 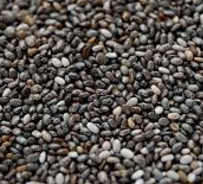 Chia seeds provide fiber as well as magnesium, manganese, molybdenum, calcium, phosphorus, niacin, copper, iron and zinc. Chia seeds have a nutlike flavor and hence it is used as an important ingredient in different dishes. It is healthy for stomach, skin as well as for hairs. Chia seeds can be served as poultry food as well as a diet for milking cows. What are Chia Seeds called in Hindi, Marathi Gujarati, Tamil, Telugu and Other Indian Languages(Regional)?